These opposite signs will complement each other with their different approaches to new experiences. Sun in Sag will explore the big picture, while Moon in Gemini takes care of the details. Their relationship will be lively, fast-moving and intellectual. Sun in Sagittarius is the great optimist. He can always see the bigger picture, which means he doesn’t get bogged down in worst-case scenarios or finicky details. 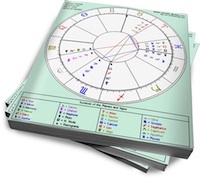 His partner will appreciate Sun in Sagittarius’ generous perspective (and sense of humour). But his tendency to skim over the fine print can be troublesome, especially if his lover wants to have a practical conversation. Although it may be difficult to picture such a buoyant sign having a Shadow, it does exist: refusing to look at the facts or glossing over relationship difficulties are some of his Shadow traits. Moon in Gemini needs to keep the conversation moving. She feels safest when discussing the finer points of her relationship, but the discussion must be more theoretical than emotional. Moon in Gemini is certainly capable of feeling, but she’s not comfortable dwelling on those feelings. Her partner will do best if he engages her mind (as well as her heart) and understands that intensive bonding is not her thing. Although she is often highly strung, a sure sign that she’s truly uncomfortable is non-stop chattering (to fill the silence, or distract from something unpleasant). Moon in Gemini will feel comfortable with Sag’s enthusiastic forward momentum, and Sun in Sagittarius will enjoy Gemini’s different perspective on whatever new issue he’s currently exploring. He’ll paint the broad strokes, and she’ll fill in the details. If Gemini gets anxious, Sun in Sag’s laid-back energy will convince her that it’s all going to be OK. These two can keep each other amused, while continually advancing the relationship into new territory.